"The skill level at CTE is high and so is how they understand our product." "I could not ask for a better vendor on all aspects." "CTE has a history of consistently high quality with on time delivery." "Die quality is the #1 reason why I choose CTE." 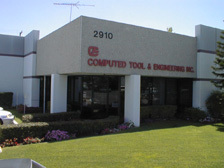 Since 1983, CTE, Inc. has grown into a world-class manufacturing facility. We are committed to total quality, 100% on-time delivery, excellent customer service, and competitive pricing. CTE, Inc. designs and manufactures stamping dies, prototypes, details, etc. CTE can handle your short or long run production stamping needs. CTE's modern industrial facility is equipped for efficiency in design, manufacture, assembly of components, and products handled and produced at our location. Industries Served Automotive, aerospace, construction, electrical, electronic, hardware, home appliances, jewelry, and medical.